Dale Lyman is a Senior Professional Cookery Instructor at William Angliss Institute, a nationally and internationally-renowned specialist centre for foods, tourism and hospitality education located in Melbourne, Australia. Dale is a Life member and Chef de Cuisine of the Australian Culinary Federation Victorian Chapter (ACFV). A Team Member of the World Association of Chefs (WACs) Young Chefs’ Development Team and proud member of LTB. Dale’s hospitality career began in regional Victoria, where he developed a taste of the industry and a healthy respect for hard work. Moving to Melbourne, Dale commenced a Cookery Apprenticeship at Onion’s Restaurant, moving on to Henry’s restaurant then the highly-acclaimed Petit Choux restaurant. Dale spent the next two years travelling and working in restaurants throughout Europe, the Middle East, the United States and Asia. Returning to Melbourne, Dale worked at two of Melbourne’s iconic restaurants, Florentino and the Adelphi before moving to Brisbane as Head Chef at Joseph Koolinski’s Chevaliers Restaurant. 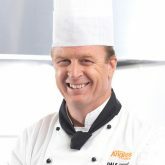 In 2001, after more than twenty years of culinary industry experience, Dale qualified to become a Professional Cookery Instructor, commencing at Melbourne’s renowned William Angliss Institute where he provides many young chefs with the skills and opportunities that have enabled them to pursue their dreams in industry. Dale has re-established William Angliss’s involvement in culinary competitions, as manager, trainer and mentors participating teams. He was also instrumental in the formation of the highly successful Australian Young Chefs Club in Victoria in his position as YCDT.